Advances in extraction technology opened the door for THC isolate. 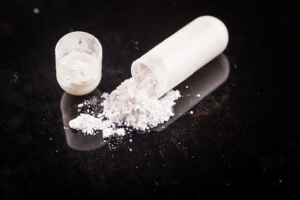 More accurately known as THC-A isolate, this substance has a variety of medical and recreational uses. Best of all, it can be psychoactive or non-psychoactive, depending on the method of consumption. Isolates are not simple products. In fact, beginners need to steer clear of isolates until they gain considerable experience with THC and – in some cases – advanced equipment. There are also major advantages and disadvantages to consider. With this in mind, fully understanding these products is extremely important. iDWeeds does NOT sell CBD products. We compare products from trusted brands to present you results based on strength, price / value, and user satisfaction. As the CBD market is flooded with shady scam sites, avoid disappointment and the risk of a contaminated product. After selecting the CBD product that suits your needs, you will be redirected to the desired page where you can place an order and check out. If you purchase a product from one of these links, we may receive a percentage of sales. Our existence depends on your support so we can provide free content and remain ads free. See our full disclosure notice. THC isolate is a crystalline substance consisting of 99% pure THC-A. Understanding the difference between the two compounds is important. THC-A is the acidic form of THC. It’s possible to consume THC-A and benefit from it, but it remains non-psychoactive in its acid form. This makes it a great choice for medical users who don’t want to get high. THC-A needs a heat source before it becomes THC. This is why people cannot simply eat cannabis buds to get high – despite this being used as a gag in Jay and Silent Bob Strike Back when our heroes try to evade being caught by the police. In the world of extracts, there are two potential varieties. The first is full-spectrum. “Full-spectrum” means that all of the strain’s terpenes were preserved in the final product. This is a good thing, as terpene content contributes to the overall health benefits and allows for a different experience depending on the specific strain used. Having terpenes allows for the “entourage effect”. This is a relationship between the THC and terpenes that increases the extract’s potency. Isolate, on the other hand, specifically removes any additional terpenes during production. Consequently, there is no entourage effect, so the THC will not hit as hard. Nonetheless, 99% pure THC-A is more than enough to experience a strong high when smoked. The good thing here is that the product’s effects are universal. There is no need to learn the laundry list of terpenes to get the desired effect. Users will be disappointed to know that it is impossible to make THC isolate at home. It requires specialized equipment, chemicals and trained experts; however, this may be a good thing, as amateur cooks who try making similar products – like dabs – at home, do so at considerable risk. The key goal is to separate the THC-A from its plant material, along with any terpenes and solvents used during the process. Chemists start with some regular cannabis extract. Next, they mix it with two chemicals – hexane and acetic acid. These help dissolve the plant material, leaving behind the THC-A. They then run the mixture through a filter to catch any residual herb. Once the liquid passes through a filter, it goes into a machine called a rotary evaporator. This device uses motion, pressure and temperature to continue separating each part of the solution. Once complete, producers are left with Δ9 tetrahydrocannabinolic acid (THC-A); however, it is not over yet. The solution still contains impurities that need to be removed. The next step is to add Sephadex-LH20, dichloromethane and chloroform to the mix. Once combined, the mixture goes back into the rotary evaporator, further removing any impurities. Finally, the chemists add methanol, running it through the evaporator and a filter. This eliminates both the remaining impurities and the methanol. The end result is THC-A isolate. There are two ways to consume THC isolate. Each offers certain advantages and disadvantages, depending on the desired effect. Users need to take this into consideration before trying this substance. The first (and simplest) way to take THC-A isolate is via ingestion. This approach is far from new. Increasingly, people have been finding the benefits of “juicing” THC-A from a cannabis plant. In other words, they essentially consume raw cannabis; however, crystals do not contain any plant material. The only way to ingest it is in pill form – which is handy for those who dislike the taste of marijuana. Oral ingestion has tremendous advantages. Again, THC-A is not psychoactive unless exposed to heat (becoming THC). This makes its behavior closer to that of cannabidiol (CBD), an inherently non-psychoactive cannabinoid with medical uses. According to Dr. William Courtney, M.D., raw THC-A may, in fact, have stronger anti-inflammatory properties than THC or CBD. Courtney also claims that isolate helps those with irritable bowel syndrome (IBS), migraines and epilepsy – to name a few. Dabbing is a highly advanced form of smoking THC. Typically, smokers use cannabis “dabs,” which are concentrates containing between 60 and 80% THC. While there are many dabbing methods, the most basic one involves heating a small amount on a special nail and inhaling the smoke. It can be dangerous, as those who simply use a dabbing nail need to heat the concentrate with a small handheld blowtorch. Fortunately, e-nails exist, which are devices that use a battery, rather than a flame, to heat the material. Nonetheless, dabbing is not for everyone, but it is the only way to use THC isolates to get high. The technique and delicate dosing means that new users should never attempt to dab. The difference between ingesting and smoking THC isolate is significant; however, this flexibility allows it to appeal to users on both sides of the spectrum. Again, THC-A is non-psychoactive, so ingesting the product provides all of the medical benefits of THC without any cognitive impairment. While the entourage effect does not come into play, the sheer concentration all but guarantees positive therapeutic results. 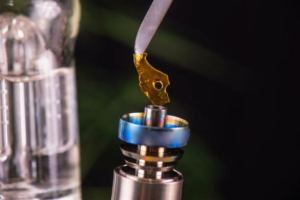 While dabbing THC isolate does provide a powerful high, the experience is radically different from regular dabs, dry herb, oils or other similar concentrates. Without terpenes to affect the experience, the effects of this product are universal. One thing that may appeal to some users is that THC isolate is completely flavorless. This is because terpenes are responsible for adding various flavors to dry herb, depending on the strain. In terms of cognitive effects, this product does not cause any kind of sedation. Those who dab isolates report that inhalation creates an energetic high that improves mental clarity and acts as a mood-enhancer. Consequently, individuals with depression or anxiety can definitely benefit from the effects of isolates. THC isolates can be derived from any THC-rich cannabis strain. The potential sources are indica, sativa or hybrid (a balanced cross between the two main strains). In many cases, products across the board will be labeled based on these strains. The vast majority of cannabis users and budtenders in Canadian dispensaries are under the impression that indica and sativa have unique effects – one being sedative and the other uplifting. Some claim that sativa is relaxing, while indica promotes energy and creativity; however, other sources claim the opposite. The truth is that neither is true. There is no evidence to suggest that sativa and indica have exclusive effects. Aside from physical and genetic differences, the impact of any strain depends entirely on terpene content. Hemp is the only variant that truly stands out, as it is rich in CBD and contains less than 1% THC, making it non-psychoactive. It is important to understand this because strains are irrelevant for any isolate product because THC isolate is terpene-free. The purity of isolate means the effect will be universal. In short, disregard strains in regards to isolated products. Aside from their psychoactive potency (or lack thereof), there are other advantages to consider when it comes to THC isolate. THC-A isolate carries a huge advantage in this area. Since users need to take it in pill form, it is easy to disguise when taking it for therapeutic purposes. This is especially true in the workplace, where people may not be keen to advertise the use of medical cannabis. It is also completely odorless and flavorless. Other edible products may offer similar levels of discretion, but the containers can emit an odor. It also may leave a slight scent in the user’s breath. There is also the concern of spilling products like oils, which will definitely be noticeable to anyone in the general vicinity. Being able to simply swallow THC-A means that it is extremely convenient to use. Simply swallow a pill when needed – no equipment necessary. Being 99% pure THC-A or THC offers a very potent experience. For oral users, a very small amount provides powerful therapeutic benefits. Meanwhile, those who decide to dab can get a very effective psychoactive effect. Like all cannabis products, THC isolate is not perfect. There are some issues to consider, depending on the method of consumption. Individuals who ingest THC-A have to deal with the slow-acting nature that plagues all edibles. Despite its potency, isolate needs to be digested, so immediate relief is not an option. Unfortunately, patients who do not want to dab have to accept this, or switch methods and be willing to deal with its psychoactive properties. Ingestion is inherently harmless, but dabbing is another story. While there are other options for dabbing besides a small flamethrower as a heat source, dabbers need to consider the care that needs to be applied when smoking. At 99% purity, THC isolate packs a strong punch. Consequently, it is easy to accidentally take too much. While death from THC overdose is impossible, taking in too much too quickly inevitably leads to an unpleasant experience. As a countermeasure, it is wise to have some CBD on hand. CBD is a natural THC antagonist, meaning it counters the effects of its psychoactive counterpart. Best of all, this cannabinoid is also available as a dab isolate, so it is easy to take action and quickly introduce it into the bloodstream through inhalation.